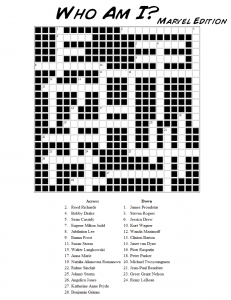 Hammerknight was kind enough to put together a nifty crossword puzzle to help you pass the time this holiday when family time crosses over from warm and endearing to homicide-inducing and you need to just get away for a few minutes. Print it for handy use later while pretending to gaze admiringly at the "Twisted Sister" sweat shirt your grandmother just gave you because she's so hip! Merry Christmas to all of you celebrating it today! And special holiday thanks to Hammerknight for taking the time to put this together for our collective amusement. 8 Responses to Goofing off time! Um, dude, Bobby Drake is Iceman. Angel is Warren Worthington III. Merry Christmas to HeroMachiniacs near and far! Hammerknight, does your awesomeness know no bounds? 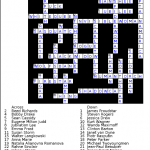 A crossword puzzle is something I never would have thought of in a million years. Unfortunately, however, my comics knowledge is so limited that I knew only a few of these. I’m slightly more familiar with the DC characters than with Marvel. I am a DC person myself, but I know some Marvel as well. I’ll try to get more puzzles done up if everyone likes them. Did you make a mistake on the Bobby Drake part? Cuz Iceman doesn’t fit there. Sorry that I didn’t catch the mistake before I sent it to Jeff. Thanks for letting me know. It was highly entertaining. I almost had everyone. Almost!